This past weekend had a wonderful time at the beach with family. Going to the beach is so relaxing to me. My son can play, yell and run around as much as he wants, and then we just shower him off and take him home. He had a wonderful time playing with his cousin in the sand, making a pool, playing with water guns, and building sand castles. Of course, I think the most fun is when they tear down the castle. In the afternoon, we had some of the best fried onion rings at a local restaurant on the beach. They were crunchy and delicious, the only bad part is that there wasn’t enough of them. So this week I had to make a big batch of them for us. I used a simple beer batter made from Blue Moon Agave Pale Ale. It’s a beer that we recently tried, and although I love Blue Moon I really didn’t care for this particular brew, but it makes one terrific beer batter. The sweet part of the beer pairs perfectly with the spices I added in the batter. 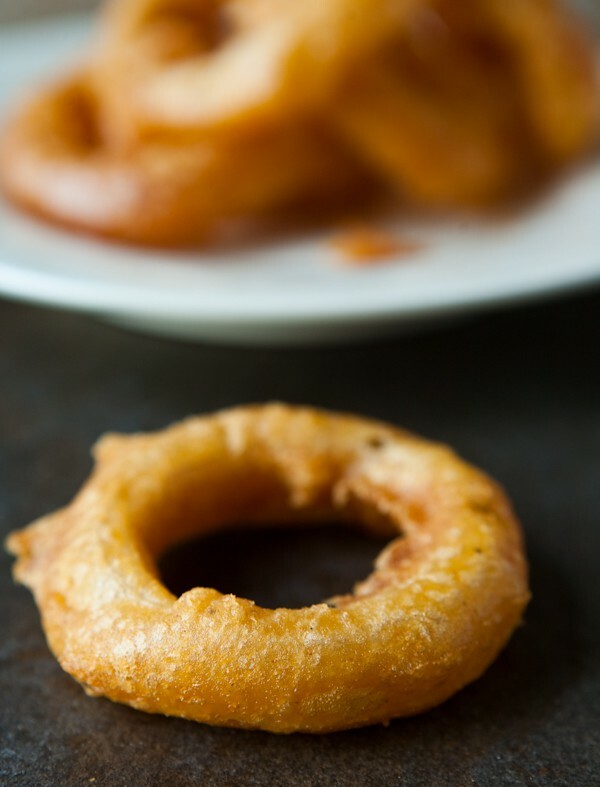 It makes a delicious slightly sweet and spicy onion ring. Preheat vegetable oil for frying to 375°. 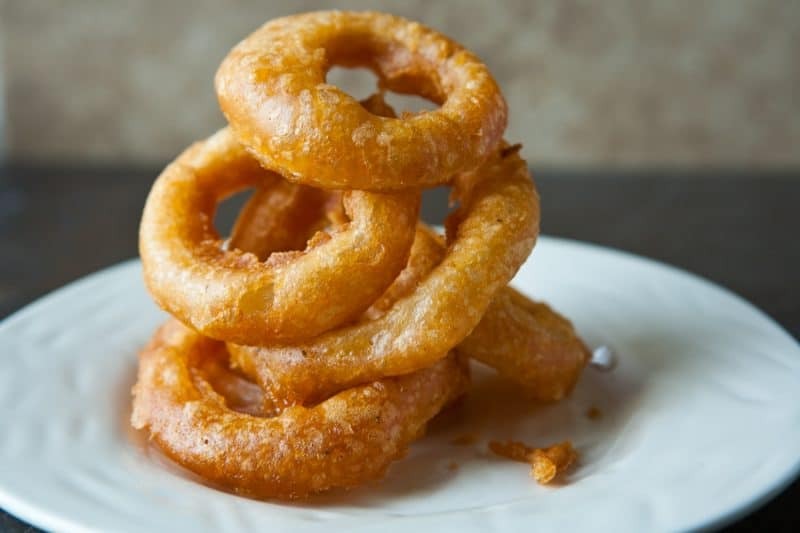 Combine onion rings with 1/2 cup self rising flour and toss to coat. In a seperate bowl, combine 1 cup self rising flour, paprika, onion powder, garlic powder, cayenne pepper and black pepper. Whisk to combine. Stir in beer and mix well. Batter each onion ring individually and drop in 375° oil. Fry for 1 - 2 minutes on each side, flipping once during the cooking process and cookin g until they are golden brown. When done, remove from oil and drain on paper towels or a cooling rack. Serve warm with your favorite dipping sauce. Delish!!! I want a batch all to myself. Mmmm! Those look incredible. I adore onion rings. And I totally agree — the beach is a wonderful place to spend a relaxing afternoon. Or day. Or lifetime. Wow, they look amazing! I love onion rings…I mean love them. 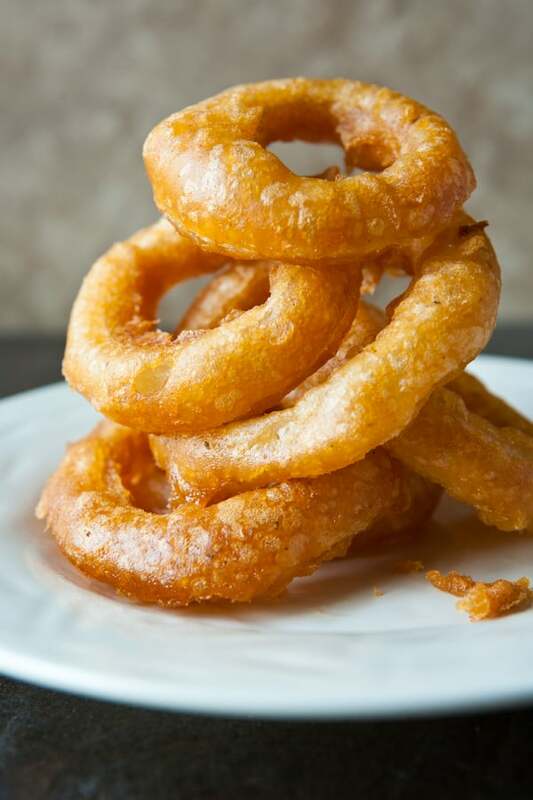 I have been drooling over these onion rings all day. Now I am making out my May menu, and guess what is totally making it to the top of the menu?! I hope that mine turn out as gorgeous as yours. These are gorgeous, Angie! You can never go wrong with beer batter and the spices (and beer) you added sound just perfect! Now I have to have some onion rings like right now! Thank you! I tried these tonight and they were tasty and not at all difficult. I had a little trouble regulating my oil temp (and as a result some were a little greasy), but that’s on me. We got it too hot then turned it way down, etc. We’re new at frying and we don’t have a Fry Daddy. Anyway, thank you. The flavor and consistency were great and the recipe worked perfectly. I can imagine the texture to be crispy and light. Thanks for sharing! Oh. My. STARS. I think I will dream about these pictures tonight! Very very wonderful batter just love love love it!!!!!! Excellent for pepper rings. Green peppers.